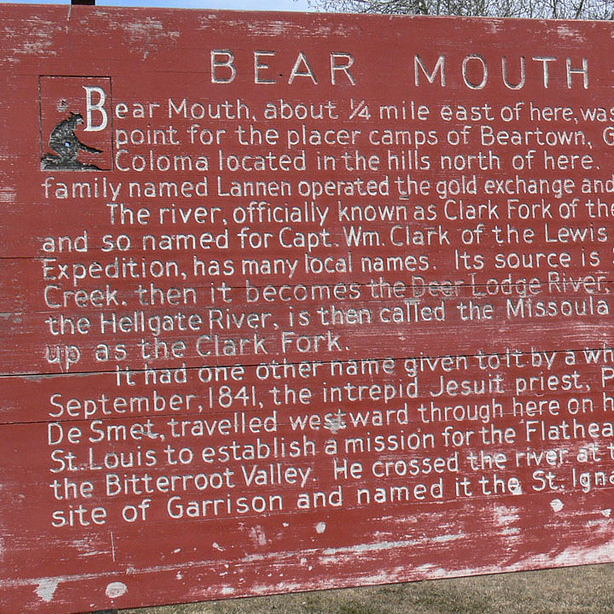 Bear Mouth, across the river to the south, was a trading point for the placer camps at Beartown, Garnet, and Coloma located in the hills north of here. A pioneer family named Lannen operated the gold exchange and a ferry boat. The river, officially known as Clark Fork of the Columbia and so named for Capt. Wm. Clark of the Lewis and Clark Expedition, has many local names. Its source is Silver Bow Creek, then it becomes the Deer Lodge River, changes to the Hellgate River is then called the Missoula and winds up as the Clark Fork. It had one other name given to it by a white man. 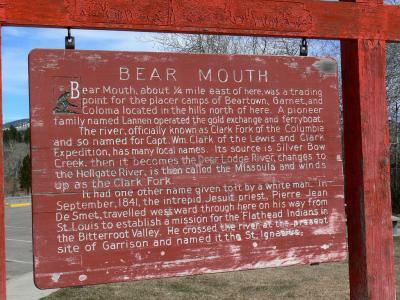 In September 1841, the intrepid Jesuit priest, Pierre Jean De Smet, traveled westward through here on his way from St. Louis to establish a mission for the Flathead Indians in the Bitter Root Valley. He crossed the river at the present site of Garrison and named it the St. Ignatius.